ALBANY — Dean G. Skelos, the leader of the New York State Senate, and his son were arrested on Monday by federal authorities on extortion, fraud and bribe solicitation charges, expanding the corruption investigation that has cast a renewed spotlight on Albany’s intractable corruption problem. The charges against Senator Skelos, 67, and his son, Adam B. Skelos, 32, were detailed in a six-count criminal complaint that quickly became mandatory reading material in the Capitol building. Politicians and their staff members pored over the 43-page complaint — an often titillating document that included references to burner phones, secretly taped conversations and strong-arm tactics that were on display even during the wake of a slain police officer. Senator Skelos, a Republican from Long Island, was accused of taking official actions to benefit a small Arizona environmental company, AbTech Industries, and a large New York developer, Glenwood Management, that had financial ties to AbTech. Senator Skelos agreed to do so, according to the complaint, as long as the companies paid his son. The arrests came just months after federal bribery and kickback charges led Assemblyman Sheldon Silver, a Democrat, to step down from his position as speaker. Mr. Skelos said on Monday that he was innocent of the charges against him, and Senate Republicans on Monday night backed his decision to remain in his leadership position. Still, the Senate corridors here were aflutter Monday with whispers about possible successors. Senator Skelos’s arrest also raised the inevitable question of who federal prosecutors might target next. For more than a year now, Preet Bharara, the United States attorney for the Southern District of New York, which oversaw the cases against both Mr. Silver and Mr. Skelos, has been waging a public campaign against corruption in Albany. Mr. Bharara has criticized the capital’s closed-door culture and its tradition of how deals are often made by Albany’s “three men in a room,” referring to the governor, the Assembly speaker and the Senate majority leader. In 2014, when Gov. Andrew M. Cuomo abruptly shut down a commission that he had established to root out wrongdoing and bring reform to Albany, Mr. Bharara started an investigation into the decision to disband the panel and publicly asked whether the governor had “bargained away” corruption investigations as part of a deal with lawmakers. On Monday, Mr. Bharara, who has been criticized for grandstanding, restricted his comments to Senator Skelos and his son. “Dean Skelos’s support for certain infrastructure projects and legislation was often based not on what was good for his constituents or good for New York, but rather on what was good for his son’s bank account,” Mr. Bharara said, announcing the charges with Diego Rodriguez, the head of the New York office of the Federal Bureau of Investigation. In a brief court proceeding in Manhattan, a federal magistrate judge, Henry B. Pitman, ordered both men released with certain conditions. Senator Skelos’s lawyer, G. Robert Gage Jr., told the judge, “I can’t imagine anyone having deeper roots in the community” than his client. Outside court, Senator Skelos said that he would be exonerated. “I know that I will be found not only not guilty but innocent,” he said. “I have absolute confidence and respect for our judicial system here in the United States of America, and utmost respect for our judges and our juries. And that’s why I will be found innocent and my son will,” too, he said. The case against Senator Skelos and his son grew out of a broad federal investigation focused on the younger man’s business dealings, some of which were reported last month by The New York Times, including payments that AbTech made to Adam Skelos over the course of several years. AbTech sells spongelike filters to remove pollutants from storm water. The complaint says that from late 2010 through 2012, Senator Skelos pressured Glenwood to direct commissions to his son. The developer complied and arranged for Adam Skelos to receive almost $200,000 from AbTech. In 2013, when Nassau County was considering awarding AbTech a contract that the senator was supporting behind the scenes, Adam Skelos told a cooperating witness that his father believed his compensation should be increased, and that if it was not, they would seek to block the contract. The county awarded the contract, worth as much as $12 million, to AbTech. Adam Skelos’s monthly installments jumped to $10,000 from $4,000. The complaint portrays Senator Skelos as eager to use his political influence to generate income for his son, who has worked in recent years as a title insurance salesman. For example, the senator repeatedly urged a senior Glenwood executive to direct title insurance business to his son, according to the complaint. The executive ended up arranging for a title insurance company to make a $20,000 payment to Adam Skelos, disguised as a commission, even though he did no work for the money, the complaint says. Adam Skelos made little secret of his father’s efforts to help his business interests. Frustrated that Nassau County was not acting promptly enough to pay AbTech, Adam Skelos suggested his father would retaliate. “I tell you this, the state is not going to do a [expletive] thing for the county,” he said on a recorded phone call in December. As for Senator Skelos, the complaint says that he promoted and voted for legislation beneficial to Glenwood, and tried to secure changes to the state’s most recent budget that would have benefited AbTech. The senior executive at Glenwood, who was deeply involved in the company’s political activities and campaign contributions, was also cooperating with federal authorities, according to the complaint. Alan Levine, a lawyer for Glenwood Management, declined to comment on the complaint. 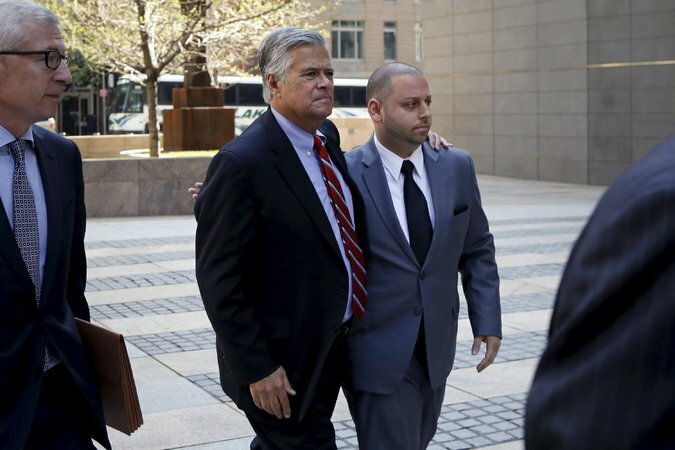 Dean and Adam Skelos were each charged with two counts of extortion under the color of official right and two counts of solicitation of bribes and gratuities, with one count of each crime alleged in relation to Glenwood and one each in relation to AbTech. Both men are also charged with conspiracy to commit extortion and conspiracy to commit honest services wire fraud.